It was back in 2015 that Muslim millionaire Ali Banat was diagnosed with cancer, a diagnosis which he used as a catalyst to use his wealth to enact positive change. 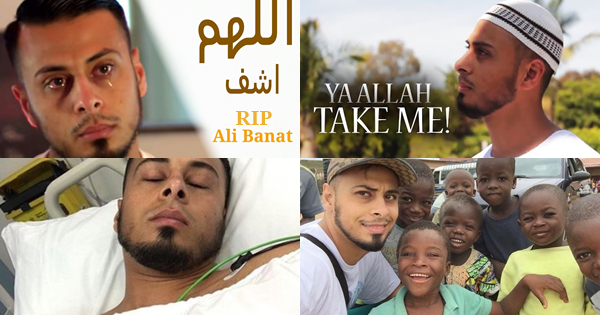 Ali Banat (born February 16, 1982), an Australian based charity worker, social activist, philanthropist, entrepreneur, and founder of the MATW (Muslims Around The World) Project passed away on Tuesday, May 30, 2018. He was initially told he had only seven months to live, but Banat - from Sydney, Australia - eventually survived for more than two years longer than doctors predicted. He passed away earlier this week, but the philanthropist and former businessman has spent the last few years raising money for underprivileged Muslims around the world, while also battling his terminal illness. In his Gifted with Cancer video, he showed off his bedroom which was lined with Louis Vuitton shoes, the only brand of footwear he wore, and a bracelet costing $60,000 (£33,945). One of his cars included a Ferrari Spider worth $600,000 (£339,237.50). For Banat, his cancer was his blessing because it brought him closer to Allah and his mankind. The reality of his life before his diagnosis deemed, more often than not, to be a mere a reflection of the shortcomings in his character and his own person. May God, indeed, give him better than what he prayed for, for himself and others. ‘When you find out you’re sick or you don’t have much time to live, this is the last thing you want to chase. And that’s how we should live our lives everyday,’ he said.